Selling Gift Vouchers to your clients. Gift Vouchers are perfect gift idea. Make it an easy option for your client's to purchase for their loved ones. If you have followed the steps in the Creating Gift Vouchers in Simple Inked article, then you'll have your collection of Gift Vouchers ready for purchase. The Gift Vouchers need to be first created in Admin, before you can sell them to a client via POS. Alternatively, you can sell your client a Variable Voucher on the fly in POS if the voucher is for an amount which you haven't pre-created. Once the client is in POS, select the Add Items link in the light orange strip. 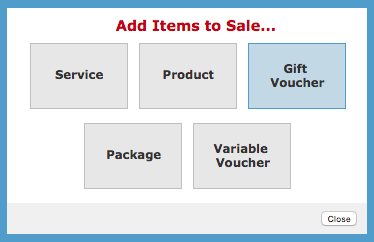 Select the Gift Voucher button from the Add Items To Sale pop up window. 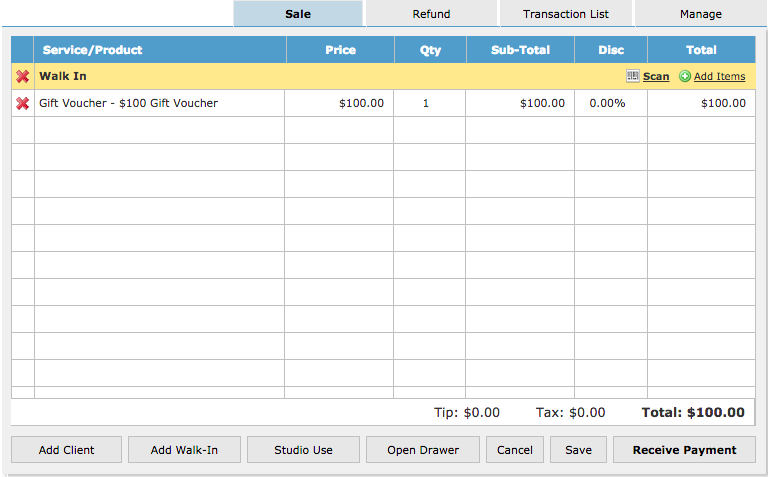 On the right side panel, choose the Gift Voucher from the drop down menus, and Save. The voucher will be added to the clients sale, ready for purchase. Click Receive Payment, choose the payment type they are using to purchase the voucher, and Finish Sale. The next step is very important. You will see the VOUCHER ID: number displayed in the pop up window. 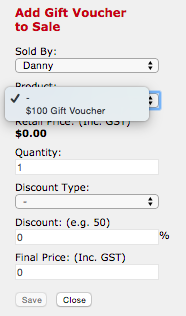 You need to write this VOUCHER ID on the physical Gift Voucher, which the client takes away with them. The VOUCHER ID will be different every time you sell a voucher. This is how the voucher is tracked. Click OK after you have copied the VOUCHER ID onto the physical voucher. When the voucher comes back, and the client wants to use it to pay for their sale you need to know what to do. So check out the How To Redeem a Gift Voucher article for steps on how to use the voucher to redeem the service, or the amount for which it is valued at.